Raise your hand, Raise your hand if you’re sure….Even more so, if you’re not! I was that girl in high school. You know. The sweaty one. It’s true- I weathered that perfect storm of pubescent hormones and anxiety that left me with sweat swirls under my pits the size of a gulf coast hurricane. I wasn’t just sweaty when I ran cross country….I was sweaty everywhere: in math class, the hallway and everywhere. I was a tall banged (it was the eighties ) walking talking humidifier. I could have grown tropical plants in there. Just sayin. Rolling up my sleeves and shoving them into my pits to act as pit guards. Layering my roll-on deodorant/antiperspirant and drying between the layers with my hairdryer. Eventually, hormones and life settled down, and I outgrew my sweatyness. But- the shame and embarrassment lived on. I took the term: “never let them see you sweat” to whole new levels. I over compensated and tried to portray a cool calm an collected appearance- at all times. I determined never to be that sweaty chick again. And just to be sure? I kept people at arms length- in case I did get a bit moist… no one would be close enough to know. What’s a MOPS Twitter party and how do I “Attend?” A Twitter party Primer for MOPS moms! What is a “twitter party” anyway? It’s a way to connect with both MOPS International (via our MOPS social media connection- they may have questions for you to answer via tweets!) and with other moms who are either attending the event in person and online or participating in the conversation at home. 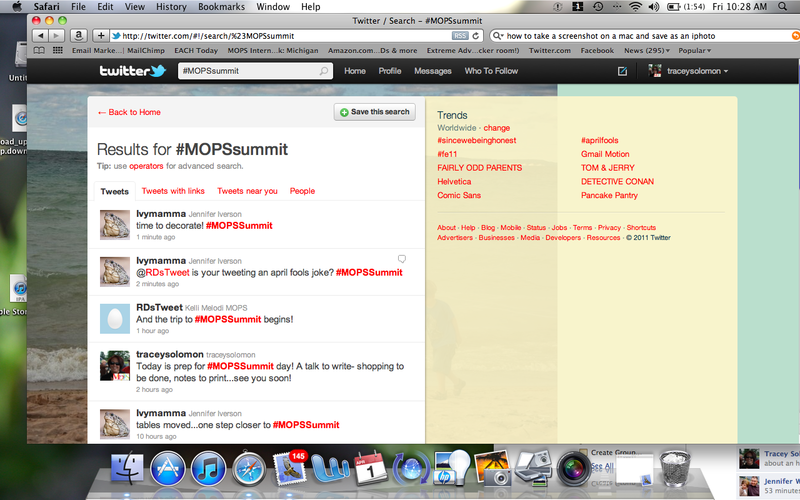 I love that Twitter gives us an opportunity to connect with Moms from all over… we really are : MOPS International! This is a way to put into practice immediately our desire/need to be wired for community! First- by creating a twitter account. You can do this on your smart phone, by downloading the appropriate twitter app (free) or on your computer. (also free ;) All it takes is an email address and about 2 minutes. How Do I “Follow” a Hashtag? How do I know who I’m taking to, and (more importantly…) is it ok to just jump into conversations? …. you can introduce yourself like you would if you saw another mom standing in line with a MOPS bag at Target. You can also click to view her “profile” and see what you may have in common..and then join the conversation. 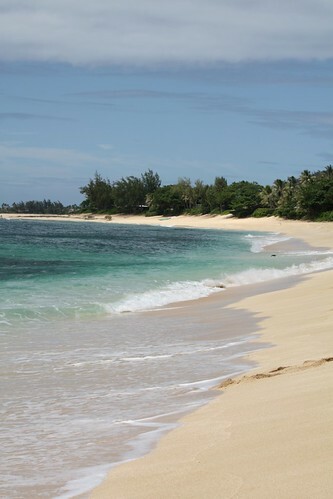 Or- you can just jump in. Twitterers know their conversations are public and expect people to join in.. it’s half the fun! (And something to keep in mind… if you don’t want anyone to hear it said.. you shouldn’t say it on twitter..) You do not need to “follow” everyone who participates… but- you can- by clicking the “follow” button on her profile. 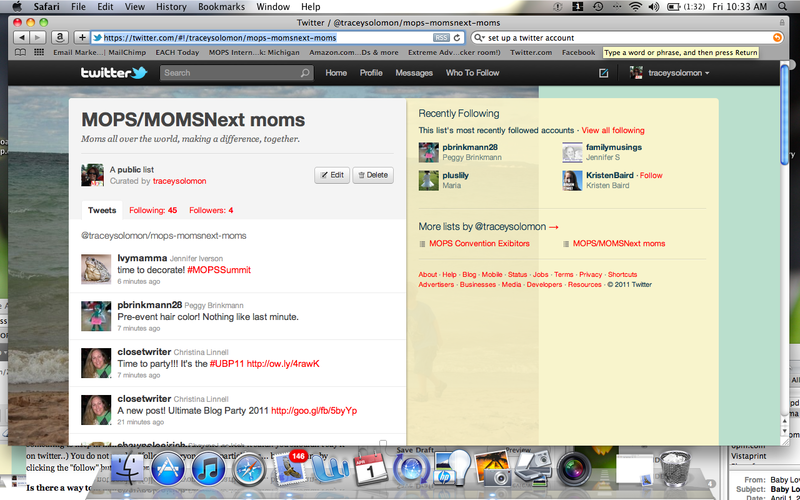 Is there a way to find other MOPS moms on Twitter? Yes- I’ve been working on a Twitter-list of all the MOPS moms I find on Twitter- You can click here to see the posts by moms on that list- and you can click at the top of the list to “follow” the list as you would a hashtag…it’s a lot of fun to hear what other MOPS moms are doing between events! If you’re on twitter and would like to be included- on the list- just message or tweet me: @traceysolomon And I’ll add you! Are there rules for Twitter parties? The bottom line? Be respectful and have fun! If you have other questions- you can reach me by email (in my sidebar- I’m a Community Networker, here in Michigan) or in the comments…Can’t wait to “virtually meet” you tomorrow during the Twitter party! I was not ready to hear that. Noah, however, was apparently, ready to do it. While I was still sifting through my emotions, my husband sprang into action. He grabbed his toolbox and headed outside, funny how Dad’s approach these things differently than moms…..
“Hurry up Mommy, we’re ready!” Noah yelled, from the front porch. “But, I’m not.” I replied under my breath. As I slowly (Why yes, I was stalling, you noticed that?.) put on my shoes, I envisioned all the things that could happen: broken bones, concussions, bruises, lacerations….. I swallowed hard, trying to shove the fear back where it came from. I reminded myself: “It’s a rite of passage… he’s ready. The older boys learned, he will too. I’d stalled as long as I could. I went outside. I saw Noah’s face. He was lit up like a Christmas tree. He was excited and mostly likely a bit afraid. He (and his dad) glowed. I watched him tighten his helmet like a Wright brother preparing for take-off. I watched his dad, steady the red “Lightening McQueen” bike as he climbed up onto the seat. I watched my husband start to run along side of him gently pushing the bike. I watched Noah start to pedal. “You can do it!” his daddy encouraged. Their faces glowed with excitement and fear. It’s a crazy busy week here- getting ready for MOPS International Leadership Summit – which is this weekend! I’m packing up prizes.. prepping a talk and gathering supplies:) Can’t wait to see everyone there! More Big Girl Knits…the answer to my clothes shopping dilemma. “Dear Clothing Designers, please get a clue” Had nothing to do with the release of “More Big Girl Knits” . But, it could have. I now have copies of both BGK and MBGK. The books are worth the price just for the shaping and pattern choice info alone! Amy and Jillian offer candid information on how to make the most of your “B’s” (Belly, B ** Bs and B ** t) The designs are varied and flattering. The sizing is good, and information on “doing the math” for an even better fit are easy to understand. (Even for a math flunkee- such as me;) Many of the issues I complained about in the prior post- are specifically answered in the combination “library” of both books. There are hoodies that flatter without making you look like a football player. Tanks that skim without showing every lump n bump (lovely lady or otherwise;) There are accessories that are proportional and stylish. All in all- a great new book as well as a terrific set when you have both. 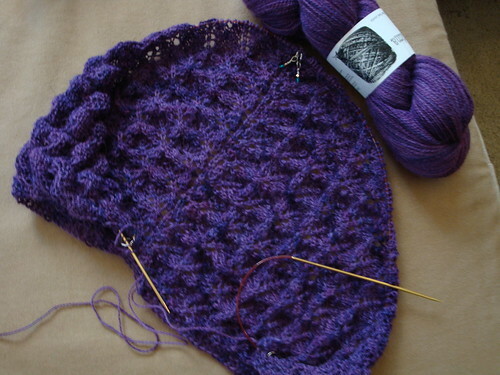 Now- If I could only knit faster….. And decide what to make first! Sunday- I’m planning on attending the More Big Girl Knits Book Launch at Threadbear in Lansing. Jillian and Amy will be there- complete with cupcakes and the samples from the book;) Can’t wait to try on and see what will work best for me!